Prayers for our new Pope Emeritus! 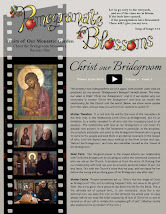 We were truly touched by Pope Benedict's last Wednesday audience, given yesterday. If you haven't read it yet, here it is below. He has truly been a father to us these past eight years, making so many contributions to the Church and to each of us individually, especially in the areas of Scripture study and the New Evangelization. We will continue to pray for him and for the outpouring of the Holy Spirit on the Cardinals and on the Church as our new Holy Father is elected. The photo was taken by Sr. Gabriella during her pilgrimage to Rome for the beatification of Blessed John Paul II in 2011, shortly before she joined the monastery. B: You are known to complain (in your head or otherwise) about the length of church services! In this second week of the Great Fast, we would like to share with you one of our favorite chapters from the book "Great Lent" by Fr. Alexander Schmemann. This book is our current dinner reading, and we recommend it to you (especially Byzantine Catholics, Orthodox and those who would like to better understand our Eastern tradition). 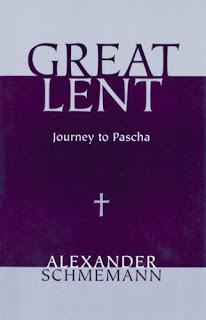 For many, if not for the majority of Orthodox Christians [and Catholics too (our note)], Lent consists of a limited number of formal, predominantly negative, rule and prescriptions: abstention from certain food, dancing, perhaps movies. Such is the degree of our alienation from the real spirit of the Church that it is almost impossible for us to understand that there is "something else"in Lent--something without which all these prescriptions lose much of their meaning. This "something else"can best be described as an "atmosphere," a "climate" into which one enters, as first of all a state of mind, soul, and spirit which for seven weeks permeates our entire life. Let us stress once more that the purpose of Lent is not to force on us a few formal obligations, but to "soften"our heart so that it may open itself to the realities of the spirit, to experience the hidden "thirst and hunger" for communion with God. 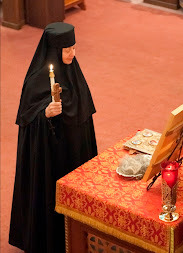 This lenten "atmosphere," this unique "state of mind," is brought about mainly by means of worship, by the various changes introduced during that season into the liturgical life. Considered separately, these changes may appear as incomprehensible "rubrics," as formal prescriptions to be formally adhered to; but understood as a whole, they reveal and communicate the spirit of Lent, they make us see, feel, and experience that bright sadness which is the true message and gift of Lent One can say without exaggeration that the spiritual fathers and the sacred writers who composed the hymns of the Lenten Triodion, who little by little organized the general structures of the lenten services, who adorned the Liturgy of the Presanctified Gifts with that special beauty which is proper to it, had a unique understanding of the human soul. They truly knew the art of repentance, and every year during Lent they make this art accessible to everyone who has ears to hear and eyes to see. The general impression, I said, is that of "bright sadness." Even a man having only a limited knowledge of worship who enters a church during a lenten service would understand almost immediately, I am sure, what is meant by this somewhat contradictory expression. On the one hand, a certain quiet sadness permeates the service: vestments are dark, the services are longer than usual and more monotonous, there is almost no movement. Readings and chants alternate yet nothing seems to "happen." At regular intervals the priest comes out of the sanctuary and reads always the same short prayer, and the whole congregation punctuates every petition of that prayer with prostrations. Thus, for a long time we stand in this monotony--in this quiet sadness. But then we begin to realize that this very length and monotony are needed if we are to experience the secret and at first unnoticeable "action" of the service in us. Little by little we begin to understand, or rather to feel, that this sadness is indeed "bright," that a mysterious transformation is about to take place in us. It is as if we were reaching a place to which the noises and the fuss of life, of the street, of all that which usually fills our days and even nights, have no access--a place where they have no power. All that which seemed so tremendously important to us as to fill our mind, that state of anxiety which has virtually become our second nature, disappear somewhere and we begin to feel free, light and happy. It is not the noisy and superficial happiness which comes and goes twenty times a day and is so fragile and fugitive; it is a deep happiness which comes not from a single and particular reason but from our soul having, in the words of Dostoevsky, touched "another world." And that which it has touched is made up of light and peace and joy, of an inexpressible trust. We understand then why the services had to be long and seemingly monotonous. We understand that it is simply impossible to pass from our normal state of mind made up almost entirely of fuss, rush, and care, into this new one without first "quieting down," without restoring in ourselves a measure of inner stability. This is why those who think of church services only in terms of "obligations," who always inquire about the required minimum ("How often must we got to church?" "How often must we pray?") can never understand the true nature of worship which is to take us into a different world--that of God's Presence!--but to to take us there slowly because our fallen nature has lost the ability to accede there naturally. Thus, as we experience this mysterious liberation, as we become "light and peaceful," the monotony and the sadness of the service acquire a new significance, they are transfigured. An inner beauty illumines them like an early ray of the sun which, while it is still dark in the valley, begins to lighten up the top of the mountain. This light and secret joy come from the long alleluias, from the entire "tonality" of lenten worship. What at first appeared as monotony now is revealed as peace; what sounded like sadness is now experienced as the very first movements of the soul recovering its lost depth. This is what the first verse of the lenten alleluia proclaims every morning: "My soul has desired Thee in the night, O God, before dawn, for Thy judgments are a light upon the earth!" "Sad brightness": the sadness of my exile, of the waste I have made of my life; the brightness of God's presence and forgiveness, the joy of the recovered desire for God, the peace of the recovered home. Such is the climate of lenten worship; such is its first and general impact on my soul. 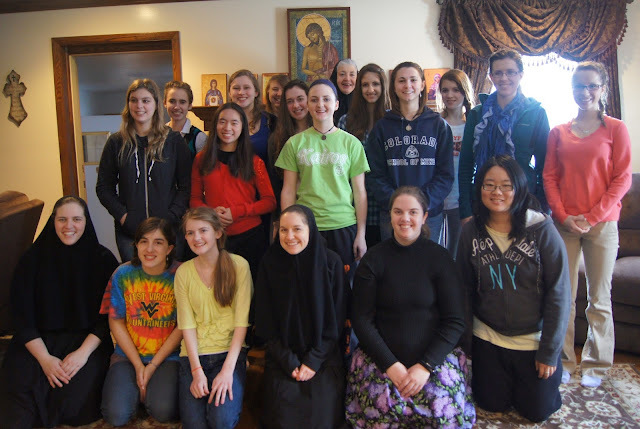 This past Saturday evening through Sunday afternoon, a great group of teen girls (from Ohio, Pennsylvania, and West Virginia) came for a sleepover at the monastery. "Teen girls want to have a sleepover at a monastery???" you might ask. Yep. And we all had a lot of fun hanging out together and playing games. We think it's important for the girls to know that they are loved, and also that we nuns are pretty "normal," in a sense! (They only had to explain a few cultural references to us that we've missed since coming to the monastery!) 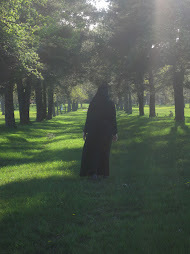 We watched the film, The Nun, about a young girl in Sweden and her counter-cultural choice to become a cloistered nun, and discussed it afterward. 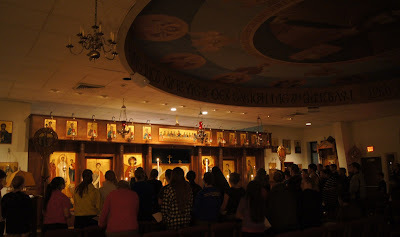 The girls also prayed with us, and it wasn't a light weekend for prayer, being Meatfare Sunday (a preparatory Sunday for Lent, also called The Sunday of the Last Judgment, because of the Gospel that is read at the Divine Liturgy). But they sure prayed, and sang beautifully!! 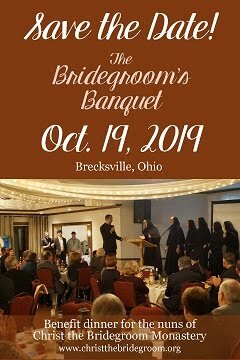 Their families joined us for Divine Liturgy and lunch on Sunday. Thanks girls, for blessing our monastery by your joyful presence! 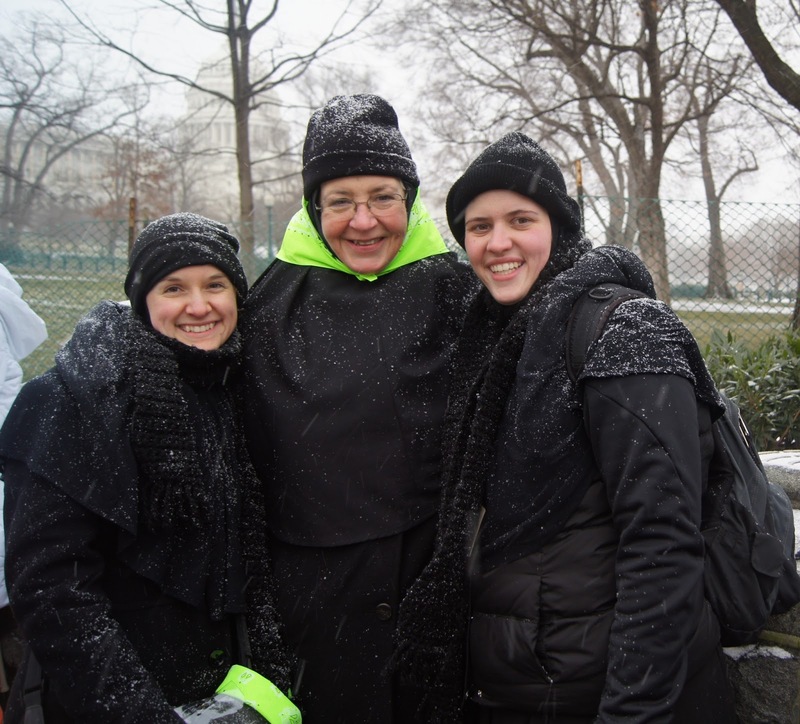 We traveled to Washington, DC, last weekend with the ByzanTEENS for Life to participate in the March for Life. 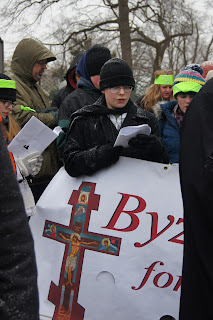 Traveling with a Byzantine Catholic group is a unique experience that most marchers don't witness, so here are a few things we do: sing our traditional Marian hymns on the bus to practice for the March, sing Marian hymns the entire time we are marching and carry icons and icon banners, pray the Akathist to the Mother of God with our bishop at the end of the March by the Supreme Court building, get herded away by the police because we are the last ones there because our prayers are so long..., visit the Ukrainian Catholic seminary and sing a few hymns in their chapel, head to Holy Transfiguration Melkite Catholic parish where we will stay for the night, pray Compline in the church before going to bed, pray Third Hour in the church in the morning, pray Great Vespers with our bishop in the Byzantine-Ruthenian chapel in the crypt of the National Basilica and attract the attention of other pilgrims by all our awesome singing, pray Compline again at Holy Transfiguration parish, witness an adult baptism at Holy Transfiguration parish on Sunday morning and participate in the parish's amazing Divine Liturgy (both of these together being about three hours), and board the bus and sing "God grant you many years" in thanksgiving to the parish for our stay. Well, we did some other things too...but these are the ones that make our trip truly unique, and as some would say, hard-core! It was a blessing to be able to participate in this pilgrimage with this great group of teenagers and to pray hard for the end to abortion and for the protection of all human life. Keep an eye out for episode 3 of "LIVE from Mumford Rd"...we'll share some of our video footage so that you can have a little taste of the Byzantine March for Life experience! Also, please enjoy this album of photos from our trip!